We make these Puzzle Stools out of oak and measure approximately 16" x 9" x 8 1/2" high. The letters of your child's name (up to six letters) are done beautifully, and are available either in red or blue, alternating red/blue, walnut or rainbow variety. 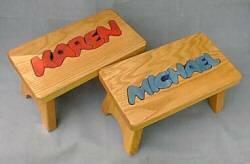 For a longer name, an additional charge may be needed as the stool will need to made longer. Choose from your choice of colors below in the drop box and to write the desired name.